I have always been an active, body conscious person. In fact, for too many years of my life, I was so body conscious that it almost cost me my life. For years, I waged war on my body; struggling to fight and control my inner demons with outward behaviors of self destruction. It’s been a long journey toward health, one that I am still on, and likely will be on forever in many ways. This past year, I have been trudging the road toward health in all aspects of my life. Exercise and fitness have been a catalyst in propelling me forward as I have learned to break the chains of dysfunction and disease physically, mentally and spiritually. I am not perfect, nor will I ever be perfect. This journey has in fact been about exactly the opposite of striving for perfection. It has been about learning to embrace my imperfections, learning from my mistakes, and healing in spite of my wounds. It has been about letting go of the need for a perfect body, but rather learning to love the body I was given, while using it to heal me rather than destroy me. Through this process, I have learned to appreciate the flaws that make me beautiful. I am learning to forgive the marks of motherhood and celebrate the meaning of them. And I am beginning to fully embrace myself, as I am, while continually working to improve myself from the inside out. 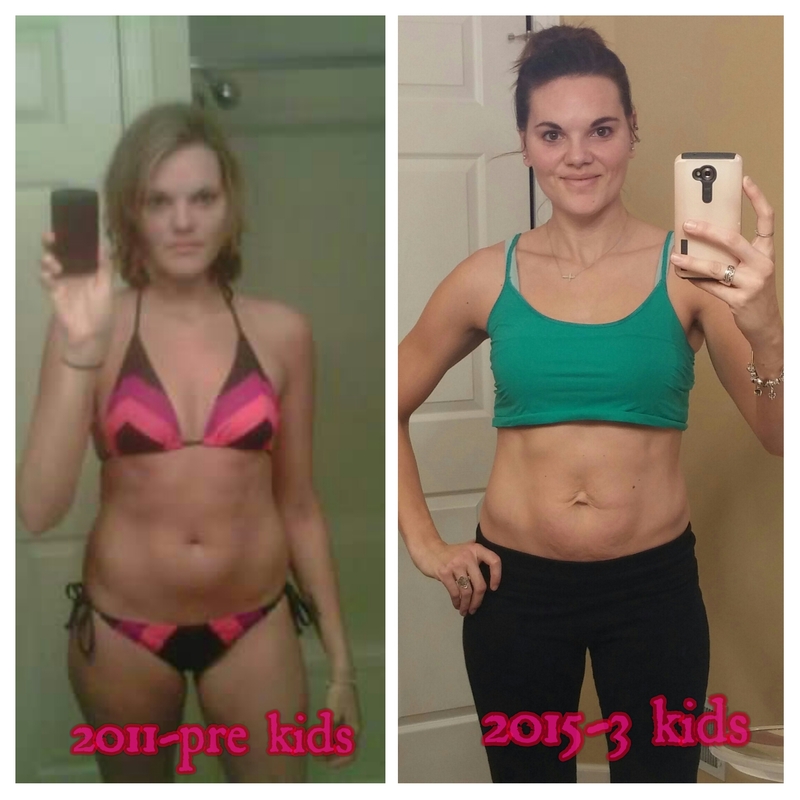 Fitness as a mom is a challenge. It doesn’t matter whether you are a stay at home mom, a working mom, a single mom or a mom with 12 sister wives. Finding the time to take care of yourself while also taking care of your babies seems almost impossible at times. But I have found, it is necessary! But not just to get a better body. In fact, that aspect almost needs to be taken out of the equation. We mamas have to take care of ourselves because if we don’t, no one else will. And if we don’t take care of ourselves, we won’t be here to take care of our babies as long as we’d like…or at least not as well as we’d like. The amazing thing I have found is that when I stopped striving for the perfect body, when I stopped destroying myself to fit the image of what I thought I needed to be, and when I started healing from the inside out, I not only felt better on the inside, I also started to look better on the outside. On the left is me, using Bulimia as a “fitness” strategy. On the right is me, using God, myself and hard work to bring myself back to life! Fitness for me has been a lifeline this past year. I began working out daily with my boys before I went back to work full time, and honestly, I was worried about how I’d be able to maintain that once I was working 40+ hours a week. It was already a struggle even being home all day, so I questioned how I’d be able to manage it when I was gone and then needing to play catch up in the evenings to spend time with my boys. The truth is, there are not enough hours in a day. But it’s about priorities. And I am finally on the list. My boys are obviously my first priority and they come above everything else. But I have learned to squeeze myself in there somewhere too. I used to work out however and whenever I could, usually with the boys running around me like a crew of crazed lunatics who just busted free from the psych ward. It was challenging. I still do it this way occasionally, but I try not to, both for their sanity and for mine. I will say though, they do make it more fun sometimes and Luke makes a really great extra weight at 27 pounds of cute! At the end of the day after the boys and I have been apart for 10ish hours, there are only about 2 hours left before they have to go to bed so we can start all over the next day. Each minute is precious. They need all of me, fully present and available for only them. And I need them too. As such, during the week, I either workout at 4:00 A.M. before work, or I workout around 9 P.M. after I have gotten the boys in bed. It’s a challenge either way because somewhere in life, you do have to sleep. I do miss a day or two sometimes, but I have finally gotten into a pretty good pattern and overall, it’s working well for everyone. 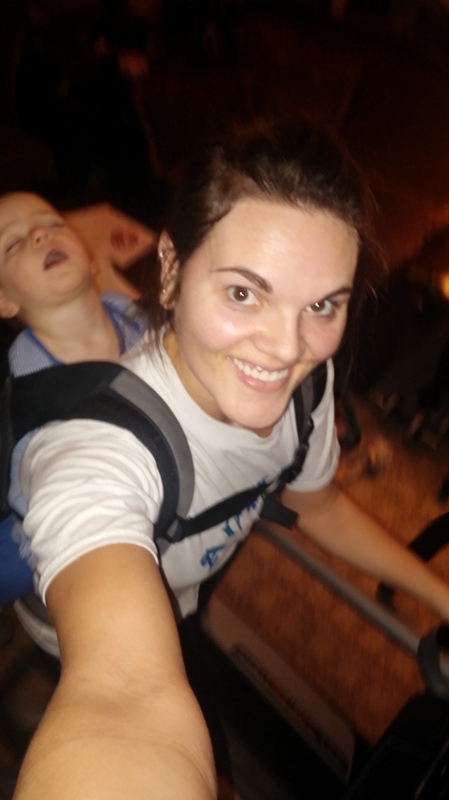 On the weekends, I either workout while the boys watch Paw Patrol or I throw Luke on my back and include him in the workout, either while the others sleep or join in with me. I typically workout somewhere between 20 and 45 minutes each day, and that’s all I can manage. I do hard workouts so that the time is well spent; but I’ve seen that short period of time is enough to shape not only my body, but also my mind and my spirit. As I have said before, my goal is not to become a fitness model. My goal is to become a model of fitness for my boys, not just physically but in all areas of my life. I think it is important for them to see me taking care of myself and making myself a priority sometimes. We moms give all we have to our kids, and that’s the way it is supposed to be. But in order to succeed in that endeavor, we have to also take care of ourselves. We have to show our children that we matter too. I don’t believe the only way to do this is through fitness, but for me, it has been a huge part of my healing and it has benefited us all. I don’t have the best body around. I still have skin that hangs down when I bend over, and no number of planks is ever going to make that go away. I have stretch marks on my stomach, and no amount of exercise will remove those from my body. I’m ok with it. I’m a mom. Those stretch marks and that flabby skin is a symbol of what saved my life. But moms don’t have to be frumpy and disheveled all the time. They don’t have to never take care of themselves and be neglected martyrs for their families 24/7. It is possible to both take care of yourself and your children successfully. It may not always be easy, and we do still typically get the left overs of “me time,” but it is possible and I have found it is absolutely essential to my survival. I’m not saying that means we all have to be fit and thin and chiseled. In my opinion, strong and healthy is so much more beautiful than thin. As long as I am strong mentally, spiritually, and emotionally, the physical strength will follow and I will be able to run the race that God has set out for me. I will be on this journey for the rest of my life, but I have learned that strong is the new thin, and I finally matter enough to myself to create that strength from the inside out! Wow, that was such an amazing compliment. Thank you! Thanks for being here and taking the time to leave such a heartfelt comment! Thank you Rachael for sharing this! 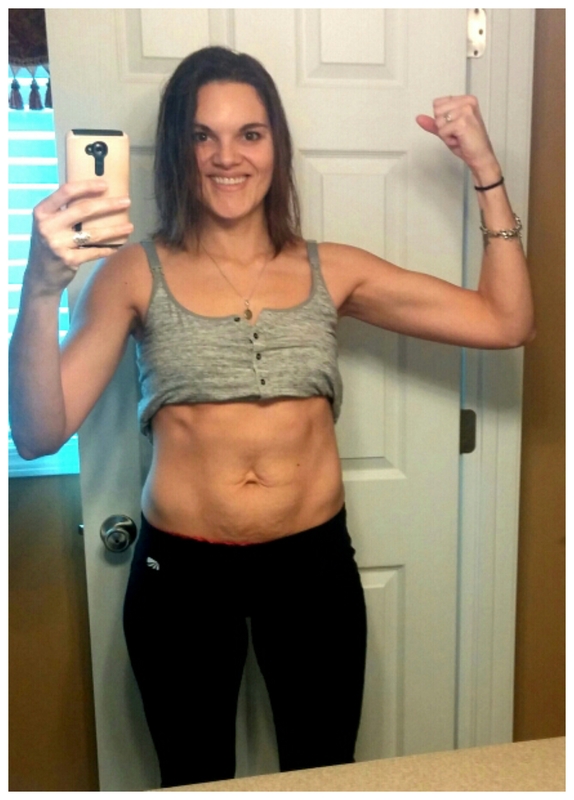 it encourages me that I can overcome the war I am in with my body!!! Thank you Sabrina! You’re fighting a tough battle and are doing an amazing job!!! You are inspiring as well! 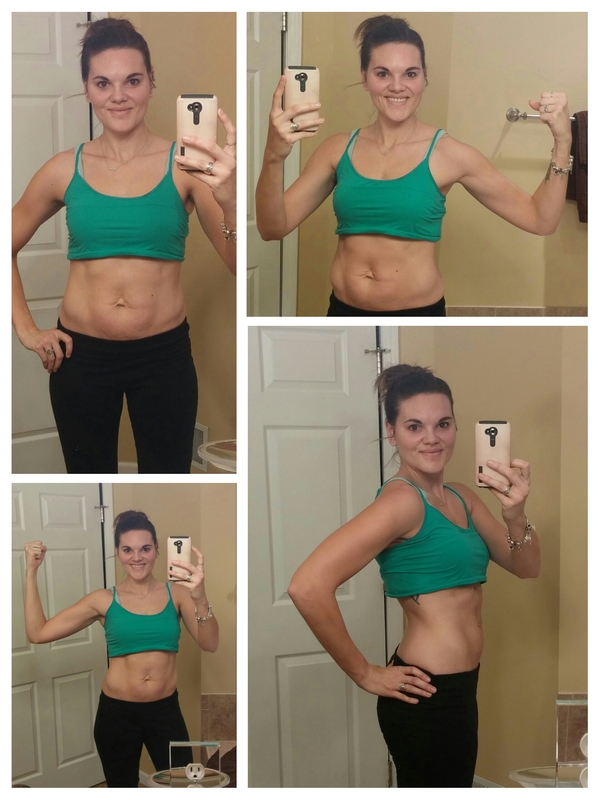 c. So proud of you for taking this path to health! i’m sure that wasn’t easy!! d. YOU LOOK AMAZING. Your hard work is paying off! By the way, has anyone ever told you that you look like that actress, Missi Pyle? Oh my goodness, you’re the best haha! Thank you! I’ll tell ya, the 4 am workouts only happen in desperate times or if for some reason I was able to go to bed by 8 and can get enough sleep to feel human at 4 am… otherwise, 9 it is!! And no, I’ve never been told that but I do appreciate the compliment! Actually…come to think of it, I think I did get that once! I’ve gotten several that I don’t really see…. but that one is pretty good 🙂 Thanks again Jacqui!! Say it a lot but so proud of you. :) This is a very important aspect of mommy life often forgotten. I can’t say I am great at routine, but Davy and I do a fair amount of running around and Sarah loves doing Just Dance with me on the Wii. I love that phrase-strong is the new thin. Very healthy outlook! You look great! Taking care of myself by exercising has been on my mind for quite some time. I really want to be healthier and I want to show my kids how important it is to take care of yourself. As always, such a great post! Good for you. You can be so proud of changing your mindset. I love your attitude. I’m not sure that I would be able to do push-ups with a baby on my back. Haha, well I struggled and only got in like 6 before my arms caved out. LOL! Thank you very much!! I wish young girls everywhere would read this! Wouldn’t it be wonderful if we all could skip that self torture phase and go straight to a healthy attitude and a healthy lifestyle? Oh my goodness, what I would give to go back and learn these lessons sooner in life, and really have them take root…. Thank you so much Shelah! Taking care of ourselves is incredibly important, something I very much overlooked with my first. I was lacking energy nor felt the need to do so. Now I do excersize at least 3x a week and feel so much better, despite having gained another child and sleeping less! Good for you finding some time for yourself now. It is a challenge but it’s important! Thank you so much!! Thank you SO much Lauren! That really means so much to me… And yes, it is hard to do it after they’re in bed. One of my biggest struggles is being hungry when I get home from work, needing to feed the boys dinner but not wanting to workout on a full stomach… so I get caught in a “Do I eat and lose the desire/ability to workout later? Do I starve and workout later and then eat way too late? Do I workout now and let the boys play and hope that works out ok? …” Its a daily conundrum haha, but somehow I usually work it out pretty well… Thanks again!!! I love you baby wearing fitness! 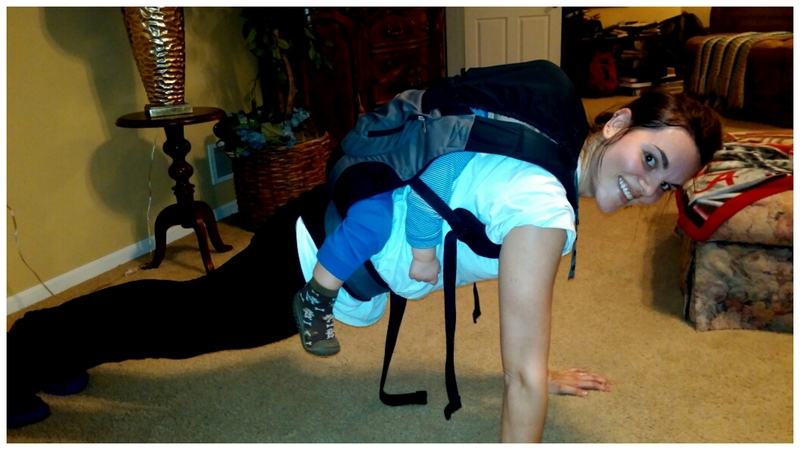 I have the same Ergo, and love taking hikes with my kids wearing it. 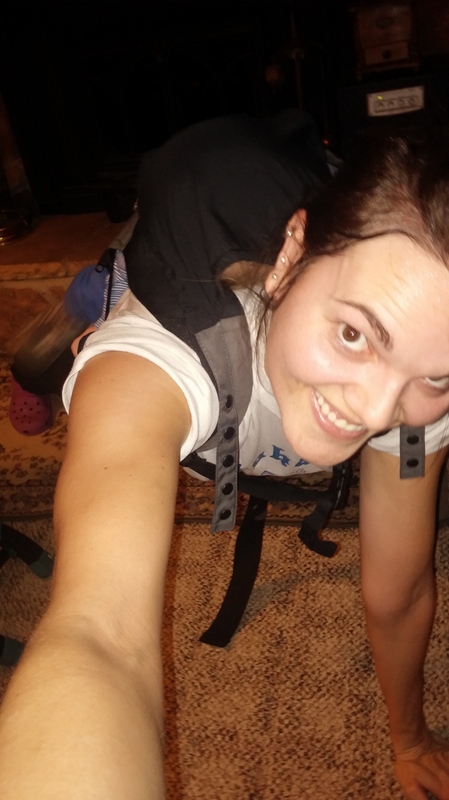 Thanks Megan… Yeah the ergo is a life saver!!! Your body is your temple. You ARE beautiful and strong! Keep up the good work. You are shining!! Oh that means a lot… thank you so much! It helps when we can remember our body is our temple rather than something in our way or somehing we hate or critique or whatever… Thanks again! You look great! I think it is so important for moms to exercise and take care of themselves but realize a perfect body isn’t necessary. I totally agree Melissa… it’s about balance! Thank you! 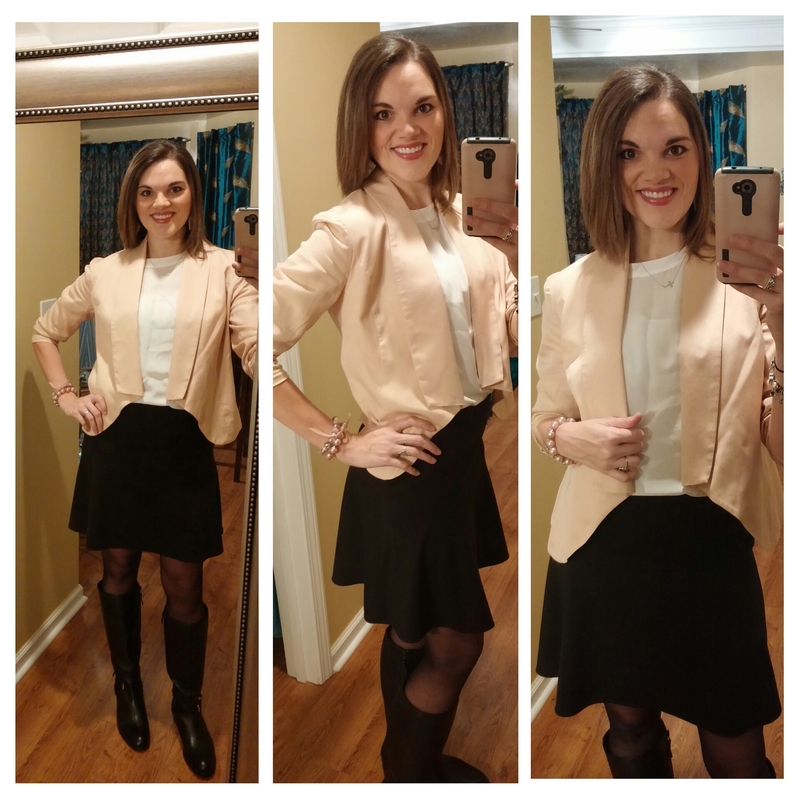 You look amazing Rachel! Someday I hope to be able to say that I workout everyday consistently but it just isn’t happening right now. You are a great role model for your boys and I know they will grow up knowing the importance of a healthy lifestyle. You look amazing! Hard work does pay off! Yes it does…in all aspects of life! Thank you so much!! You look absolutely fantastic! I’m so impressed with you and inspired. I love all the pictures of you working out with your boys. It’s a true testament to the fact that we can do anything if we set our minds to it. 🙂 Go you with your bad self! Haha, aww thank you so much Melissande!!! Comments like that encourage me to keep going! Oh my gosh, 4 am! That is truly impressive! You look great and this is a wonderful message. It’s important for Mommy to put herself on the list of priorities. Inspiring! You are so sweet! Thank you Meredith!! I have to be honest that the 4 am workouts are very few and far between…. The 9 pm time slot is much more common haha. That extra 30 minutes to an hour of sleep matters a lot more than the workout in the am haha! But I do what I can when I can… Thanks again!! Wow, you are really impressing and inspiring. I feel like I’m supposed to be on duty for my ONE boy, my husband, my household and my job 24/7… And I certainly use this as an excuse for not doing anything for myself. Thank you for your honest and motivating blog. Oh that means a lot! Thank you… It’s very hard to balance it all and to be everything to everyone at all times. What I’ve learned is you can’t be. It’s a lot to ask of ourselves to be on all the time. I struggle to be 100% all the time for my boys and then find space for myself and everything/everyone else. But so do we all…and it’s ok. We do our best and we hit the highlights and the rest has to wait til the next day! 🙂 But do put yourself on the list!! I loved this piece so much!! Beautiful, and much needed in the society we live in. You are so right about being stronger in order to be a better mama!! I hope it’s okay to say but you are glowing with health & happiness in your pics now as compared to your before pic. You are a beautiful, strong Mama! And a great writer! I totally agree with everything you wrote. It’s really important to take time for ourselves. You look amazing!!! Thank you so much Tricia! I really appreciate that! I so appreciate your posts. Keep the vibrant thoughts flowing! That means a lot to me! Thank you.